Most probably, one of the secrets of the success of the Pershing boats, born from the fortunate collaboration of Fulvio De Simoni with the Cantieri Navali dell'Adriatico, lies in the genially creative ability of the designer and the renovating capacity of the yard. Each Pershing boat is similar in style and comfort, yet each one represents a point of reference for yacht design. The latest Pershing 65 includes new details that may be used for open boats of the third millennium. The outside line is similar to a "spade" that cuts through the air and the sea and that, most probably, reaches in this 65 footer a definitive level of perfection. It is quite difficult to talk about this boat without having been bewitched. The logical, natural yet futuristic design that links shapes, spaces and fittings is evident: the hard top, the side windows, the wing-like shape of the roll bar, the aft sunning area with the innovative cushioned sunpads. The aft platform is connected to the cockpit by means of steps that may be used as additional platforms and the cockpit setup and shape are very similar to those of bigger boats with flying bridge or with an all-weather sun deck. The above-mentioned characteristics and smaller details suggest how yacht design evolved thanks to boats like this one. The Pershing 65 also offers a renovated interior layout highlighted by a bold choice of colors and elegant and innovative solutions and furnishing. The Pershing style represents a sort of love proposal for comfort and privacy, wanting to offer the maximum ever and always. Last but not least is the "heart" of the boat that beats inside her hull: 2,700 hp Caterpillar with ASD 12L stern drive. 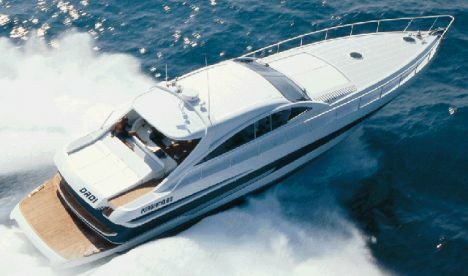 The Cantieri Navali dell'Adriatico worked out the best and most innovative solution for transmission and propulsion. This boat and her performance (with a maximum speed of 49 knots and a cruising speed of 42 knots) show that her successful appreciation by a very demanding and competent clientele does not occur by chance. Draft from lower tip of propellers: 3'1"
Full boat displacement: 61,810 lbs. Total engines and reduction gears weight: 10,153 lbs. Price with standard equipment and test boat power: Lit. 2,860,000,000 ex VAT. Superstructures and windows materials: anodized light alloy fittings, windows in tempered glass. Chart table: chart table is to port of the helm station with settee that seats two - Galley: to starboard of the companionway, with large marble worktop, two stainless steel sinks, ceramic hobs, cupboards and cabinets and freezer/refrigerator to port. Standard fittings: in addition to the fittings listed in the Technical Data section, the boat includes air conditioners in all cabins, hydraulic flaps, 37-gallon freezer/refrigerator in the galley and a 21-gallon refrigerator on deck, 8 kW generating set, dinette and cockpit stereo and CD player, complete weather station, multi-standard color TV set and VCR, bow thruster. Visibility in different weather conditions: excellent - Docking maneuverability: excellent. Cockpit: very comfortable with luxurious arrangements. The cockpit may be likened to a deck salon, to a "yacht gazebo"
Electrical switchboard and plants: the electrical switchboard is very ample and adequate, it is fitted to starboard of the companionway, aft of the galley. Electrical plants are of excellent quality.